At least to me. 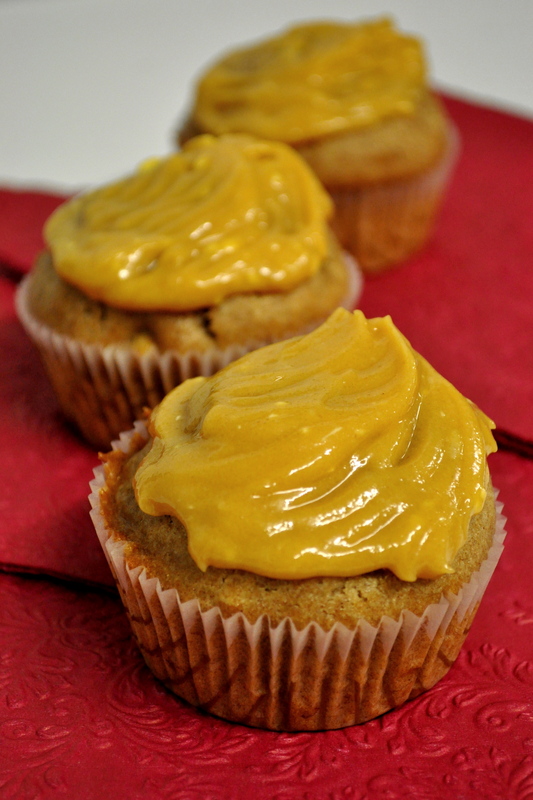 Banana cupcakes with peanut butter frosting. Never had them before – yeah, shame on me. All I ever did was spread peanut butter on a banana and eat it simply that way. Having noticed a couple of ripe bananas (don’t like eating the ripe ones by themselves), I considered making some banana bread. But no – why so simple? Cupcake time, that’s the plan! Preheat your oven to 175°C (about 350°F). Mash the ripe bananas until really mushy. Then add sugar, canola oil, soy milk, vanilla extract and mix very well. In another bowl, mix together flour, cinnamon, nutmeg and salt. Fold the dry ingredients into the wet, cup by cup and mix everything together until well incorporated. Finally, add in the walnuts, if you like. Use an ice-cream scoop to fill the paper cups. It definitely helps a lot. Bake for about 23 minutes (do the toothpick trick, the cakes are done when it comes out clean). 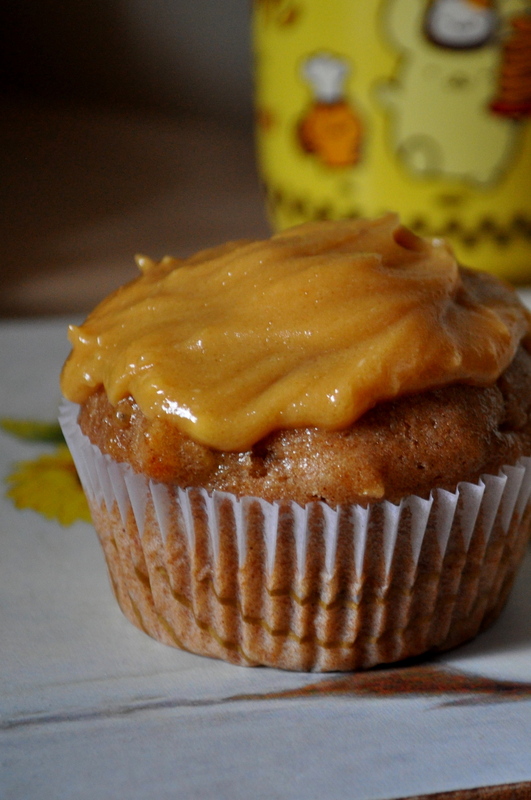 For the frosting, simply beat the peanut butter, sugar, powdered sugar and margarine together. I’m no good for making frostings, so if you don’t like something about the texture, add in more or less of what you think is needed. Definitely Long Time No See! A little twist on my raw lasagna recipe. “Noodle” layers are Zucchini. Between the layers: an olive & sundried tomato marinara, cashew & basil “ricotta” and some mâche salad. Drizzled with some olive oil – done. My favorite raw food dish, probably even one of my favorite dishes in general. So no jokes on raw foodies, I’ve seen a hell of a lot of inspiring raw vegan blogs on health, weight loss and recently a blog on daily raw food plans under 10$! (which is great because it seemed a little intimidating, buying many expensive superfoods, gadgets, etc. just to be raw) At the moment, I’m trying to eat at least one raw vegan meal a day. Just to feel healthier as I’ve had my large part of junk food, candy and heavy meals around Christmas. Next up: A nice vegan pizza, though a lot different from the traditional version. Marinara sauce, TVP and some baby spinach. As you might notice, neither regular cheese (duh) or a vegan substitute. When walking around town, I like to go into the health food stores and nearly always find something great: vegan whipped cream, once vegan cream cheese, all kinds of fake meat, lots of milk substitutes, even vegan ricemilk chocolate (heavenly by the way). But unfortunately, I haven’t found a vegan cheese subs in Germany until now. Until the day comes when I finally find something, I’ll have to rely on homemade versions. Back to the raw: An amazingly creamy raw vegan mind ice cream adapted from Jennifer Cornbleet’s book Raw for Dessert. I absolutely adore this ice cream for its naturally minty flavor (not the artificial minty-stinging type you often taste in ice creams) and the creamy texture, making it able to compete with good dairy-based ice creams. Something tells me I’ll be making this one again soon. I love these double choc muffins by Celine Steen of Have Cake Will Travel, even though I’m not the chocolate type. Plus they’re low in fat! Get the recipehere. And the last, but definitely not least, part of this blog post: Vegan omelette! Yes, it is indeed possible. Aside from my omelette folding technique, which always left much to desire, even during my pre-vegan times, this actually looks a lot like egg and the flavor kind of resembles it. The texture is different, but I’ll be working on that. Yes, sweet pancakes for lunch! Even though this is rather a Sunday morning dish, I just had the craving for something sweet. I’d love to eat either sauerkraut with mashed potatoes or apple pancakes when going over to my grandparents’ house. Not having had any pancakes in months, I thought I might treat myself to some apple “buttermilk” pancakes. All one has to do is substitute the real buttermilk is add some soy yogurt and lemon juice into the non-dairy milk (in the following case, soy milk), whisk it together and there you have it – vegan buttermilk. By the way, before telling you the recipe: I tend to change the measurements by mood, sometimes using “cups”, sometimes gr/ml. If this is a problem or kind of annoys you, feel free to tell me – I’ll change it. Furthermore, I make most dishes in small portions, about one to two servings – double or quadruple the ingredients in my recipes if you like! Add the soy yogurt, a pinch of salt and lemon juice into a small bowl. Slowly pour in the non-dairy milk, stirring the mixture until completely smooth. Combine the flour, sugar, baking powder and another pinch of salt in a bigger bowl. Incorporate the “buttermilk”-mixture into the dry, whisking until there are no lumps left. Set your stove on medium high and heat a small pan. When the pan is hot, melt the margarine and add 1/4 of the batter (as the recipe will make about 4 pancakes). 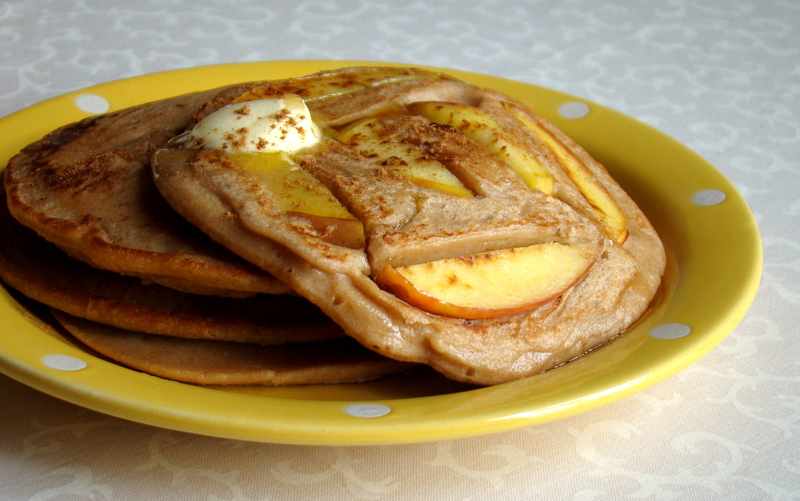 Decorate the pancake with the apple slices and flip once the bottom is brown. 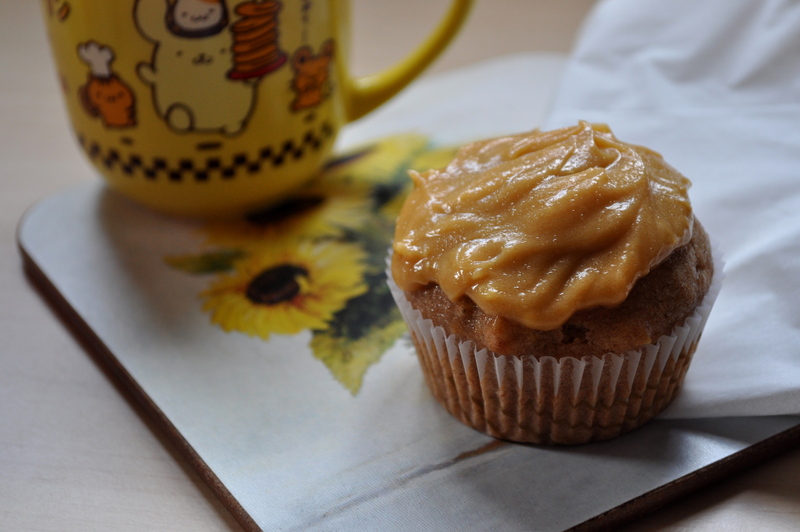 I topped mine with some cinnamon, maple syrup and some vegan margarine. The recipe will serve between one and two people (4 pancakes if you’re really hungry, 2 as a snack.. I had 3 ^__^), but feel free to double it if you please! I used to love eating potato salads, especially those my grandma made. 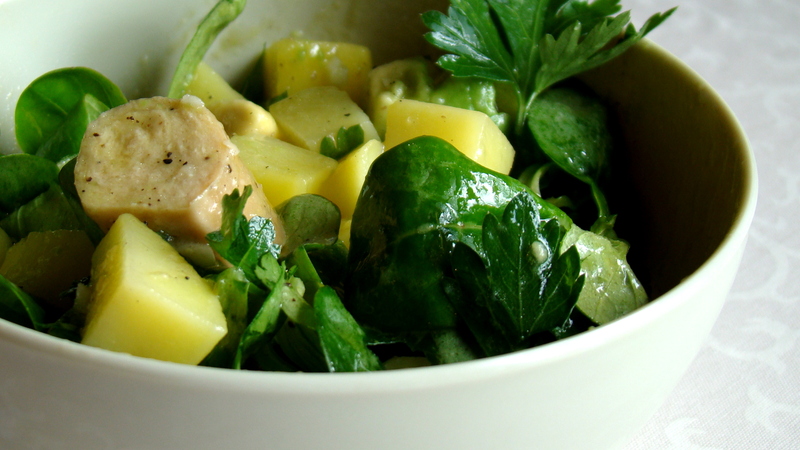 Typical German potato salad at BBQ parties: cooked slices or chunks of potatoes, lots of mayonnaise and chunks of pickled cucumber and boiled eggs. Thinking about it, I’d always feel really stuffed (hardly eating much of the meat) and often sick due to the potato salad being a very, very heavy (side) dish. – Good for me! ‘Cause now, not being able to eat the store bought ones (which look kind of gross anyway) and the ones at parties, I might aswell introduce others to a more refreshing and flavourful alternative. Boil the potatoes and cook them in well-salted water until tender, though make sure they’re not too soft. If you decided to use the tofu hotdogs aswell, add them to the boiling water 4 minutes before the potatoes are ready. Drain everything and set aside to cool. For the dressing, squeeze out the juice of 1/2 a lemon into a bowl. Add the wasabi and stir until there are no lumps left. Mix in the remaining ingredients. When the potatoes and hot dogs have cooled down completely, dice the potatoes and slice the hot dogs. 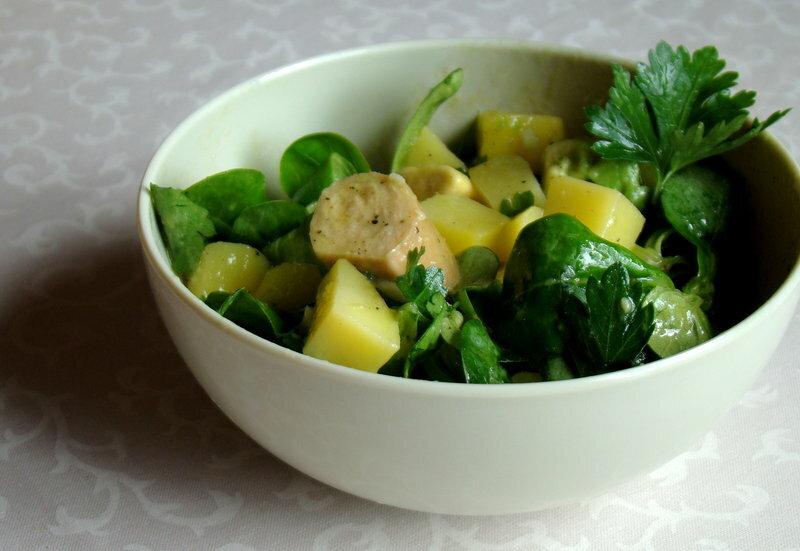 Mix them in a salad bowl with the dressing and put everything into the fridge to let the flavours intensify. In the meantime, wash your greens, chop the parsley and dice the avocado. Add them to the potatoes once they’ve sat in the fridge for about 10-15 minutes. Enjoy! It’s been a terribly cold and LONG winter here in Germany. I’ve been hearing people talk about the coldest winter since 30 years ago and on top of that: icy temperatures until mid of May, hardly having had the spring feeling at all. Now that that’s finally over, it seems like summer time to me! Except for the hay fever and the important test I have to study for, I surely am in the best mood. To me, anything above 18°C is a dream come true. And what would a hot summer’s day be without.. make a guess.. yay, ice cream! Due to not having an ice cream maker, my first attempts of putting the ice cream mixture straight into the freezer were quite a failure, kind of like a solid block of ice you could throw at someone (not that I would.. hm..). I then tried a recipe from Hannah Kaminsky’s My Sweet Vegan – her “Green Tea Freezer Pops”. They turned out great, even keeping my picky, always complaining sister satisfied. 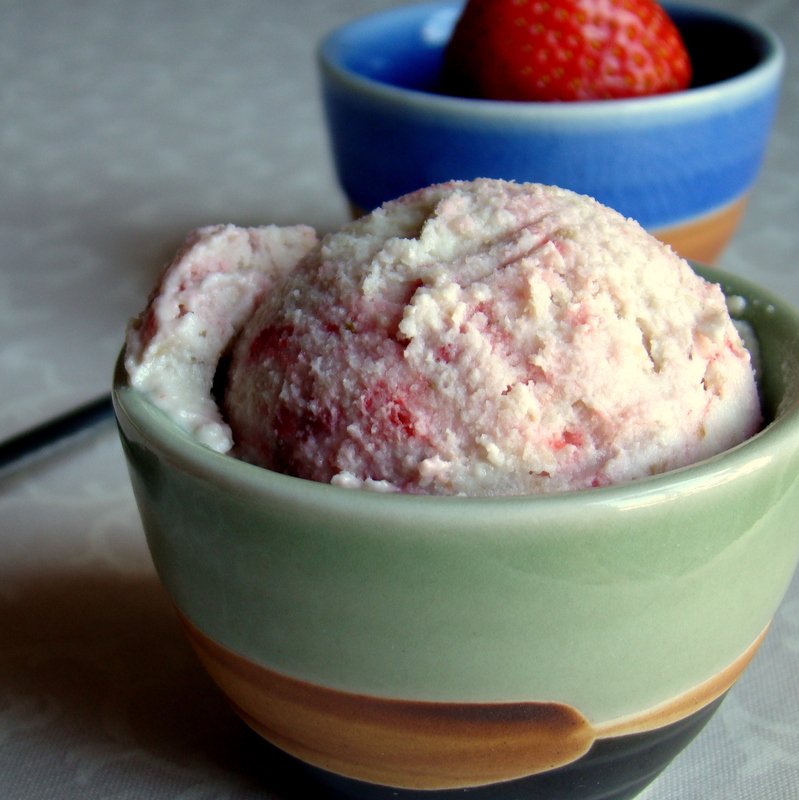 Really surprised by the result, the ice cream is creamy, refreshing and actually reminds me of cheesecake. Made with a base of half cashews, half macadamia nuts (almonds would probably be great aswell) and some water, raw pie crust made from walnuts, dates and a pinch of salt, finely chopped strawberries, some agave as sweetener and some lemon juice, the result was pretty good. It’s really surprising how creamy (and obviously rich) a nut based ice cream is and I’ll definitely be experimenting on some other versions in the future! 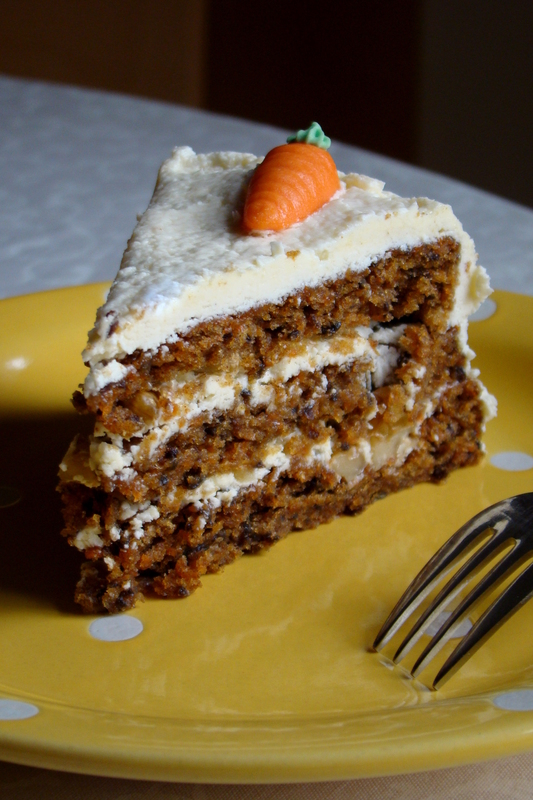 As a gift for Mother’s Day, I made my Mom a cake – a carrot cake, to be precise. 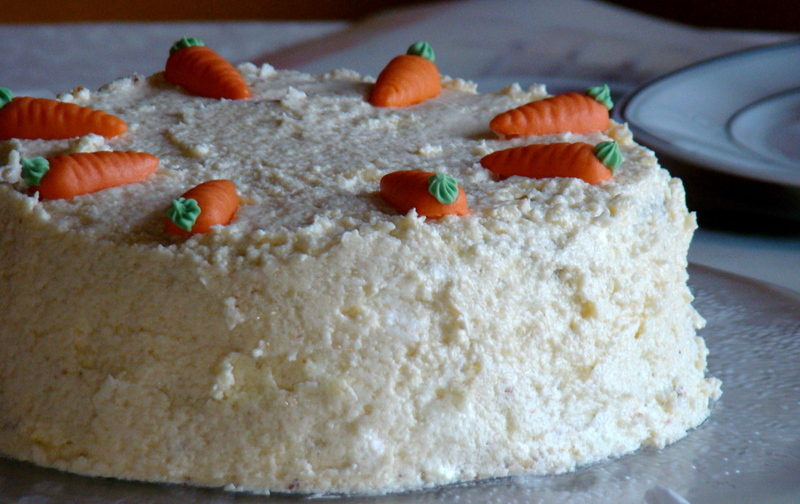 To be a bit more exact: A carrot cake with vanilla “cream cheese” frosting, decorated with marzipan carrots. It tasted great, no I’m not happy with the frosting. Instead of being all creamy, it still had little margarine chunks in it, even though I had beaten the frosting ingredients together for quite some time. This also made the spreading of it onto the cake rather difficult, making it quite impossible to get the sides even. Other than that, everyone seemed to have enjoyed the cake (yes, I’m actually the critical one) and I’m really glad my Mom was happy about her gift. Hope you’ve had or are having a great Mother’s Day! Having tried all kinds of non-dairy milks (such as soy, rice, oat, etc.) and all of them store-bought, I suddenly thought Why not make my own vegan milk? 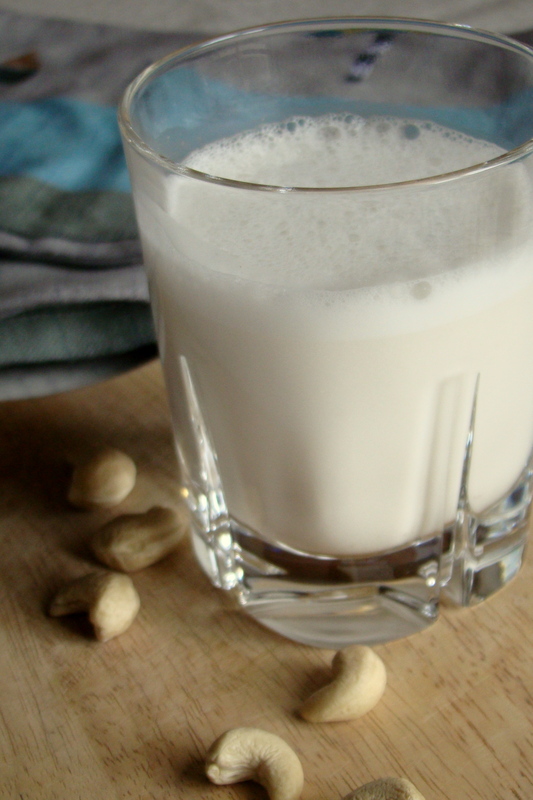 And as I had never tried nut milk before, I grabbed out my favorite ones – cashews! Soak the cashew nuts in double amount of water for 2 hours. Drain and rinse them afterwards. Place the soaked cashews into a blender with about about 2 cups of water and blend until smooth. You’ll have to keep it blending for about 2 minutes as there will be quite chunky otherwise. Depending on what texture you like, just add more water. Finally, add the agave and salt. You might have to strain it as mine was still a bit chunky at the end. My blender isn’t that new, so it depends. Enjoy it with granola, by itself or any other way you like!